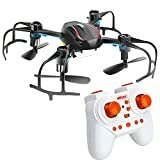 · COOL Model: the mini drone, which possesses extremely spatial model, BLACK SPIDER at night, with Florida LED light, attracts the gaze of other companions and gives unique fun to you. · Quadcopter Drone Process: With 2.4GHz against crossover, 100m distance control, 0.01s reaction time, the quadcopter offers you a perfect flying experience. · More fun: With 3D jumps and rolls.the quadcopter can fly both indoors and outdoors. And With high low-speed switching, it´s easy to choose the speed. · Easy to play: Free switching between right-hand and left-hand throttle. Weighs 0.02 kg, easy to carry. If there is any problem, please contact us by e-mail. · Features: The new designed structure facilitates assembly and maintenance.The full charged battery can support 5-7 the constant flight of minutes.Function: Up / Down, turn left/right, left, right, flying laterally, 3D flips, 3D rolls, a key roll button, control model GravitySpecification: Frequency: 2.4GHzFlight distance: more than 20m.Channel: 4CHGyroscope: 6-axis spinBlade: 36mmSize: 90 * 90 * 30m / 19.5gBattery: Li-Poly, 3.7V / 180mBattery transmitter: 3 * 1.5V AAA (not included) Charging time: Approximately 30minsFlight time: Approximately 6minsLED light: Built in bright light LEDMaterial: High quality nylon black colorUse: Indoor and OutdoorFor over 14 yearsPackage: Color box.Package size: 14 * 13.3 * 11.5cmPackage included: 1 * RC quadcopter, 1 * Transmitter, 1 * Li-Poly battery, 4 * Spare foil, 1 * Charger, 1 * ManualA perfect drone to get started in the world of drones. You have a drone with a stable and smooth flight that goes perfect indoors and defends quite well in outdoor flying with gusts of wind thanks to its 6-axis gyroscope. You have two flight modes. A slower mode perfect for indoor flight and beginners. The fastest mode can be used outdoors and by the most experienced riders because it is capable of achieving high speeds. To facilitate the flight in low light situations bring some LEDs.